Are You Afraid of the Shadows? After having induced an irrational fear of statues amongst the youth of the nation last year, Steven Moffat has certainly had a good go at making them afraid of shadows this time around! Much as he did with his previous two part story for Doctor Who, the excellent Empty Child, Silence in the Library leaves you with a stack of questions at the end of it’s forty-five minutes. The bemusement comes right from the beginning, with the pre-credits sequence that finds a young girl talking to a psychiatrist about visions she has been having about a giant deserted library, however as she is describing an ongoing vision suddenly her empty library is broken into by the Doctor and Donna. After the opening credits we get a little bit of flashback to bring the time travellers to the same point in the story, so we see the Doctor and Donna landing in the deserted library and looking around, discovering that their arrival is not an accident – the Doctor has received a personal message on his psychic paper summoning him – and that although they are the only two humanoids on the planet there are more than a million million (a long-scale billion, rather than the now more common American billion) life-forms detected – but why can’t they see them? What is interesting is that when we see the meeting that occurred in the pre-credit sequence from the others side, the Doctor and Donna are merely meeting a security camera. When the girl in shock snaps out of her vision, the security camera fails, but as the Doctor with his sonic screwdriver attempts to reactivate the security camera, the girl feels the effects in the other reality. the Doctor and Donna are not without people to talk to in the library however. They have been told what has happened to the library thanks to a message delivered by one of the automated nodes, which chillingly are robots with real human faces, apparently donated to the library after death. The first node they meet recounts the last moments of the last people in the library. Later on we discover that whilst nobody lived, the last four thousand people on the planet were ‘saved’ – but what does that mean? Once the exploration team are on the scene, the action kicks off as fairly swiftly one of the team is killed in gruesome fashion, leaving only bones and tattered remains of her clothing. The Doctor describes the cause as being Vashta Nerada, swarm creatures that live in the dark, and strip a creature of it’s flesh. In a typical â€œterrify the kidsâ€? moment the Doctor says that they exist all over the universe, even on Earth, hiding in shadows, waiting for prey. They appear just as shadows, so when later on one of the exploration team inexplicably gains a second shadow, the Doctor knows something is wrong with him. As he has done previously, the Doctor gets his companion to safety, transporting her, he thinks, back to the safety of the TARDIS, but unbeknownst to him something goes wrong, and it is not until a few minutes later, being chased by Vashta Nerada, the Doctor finds a node with the face of Donna starring back. The node confirms that Donna too has been ‘saved’, much like the four thousand or so others. Then there is just the question of the girl. 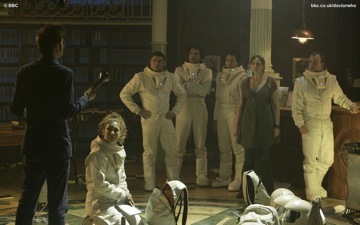 During the episode on a number of occasions the world of the library, and this other reality cross over, with the Doctor and the girl managing to communicate, and her almost robot-like reporting when Donna has been saved. There is certainly something significant going on, as on the wall of the house in which she is are what are obviously the drawings of a child, but is that a wolf in one, and someone that looks rather like Rose in another? Even more intriguing is towards the end of the episode when Doctor Moon, the psychiatrist tells the girl that the library in her visions is real, not her reality, and that she is the key to saving people in the library. Like all the best first parts, it leaves you with a ton of questions, and wishing you didn’t have to wait a week for part two!